Just a mere 8 days after my PR finish at the Chickamauga Marathon, I was getting ready to run the Flying Monkey Marathon (11/18/2012). The Flying Monkey Marathon is my absolute favorite marathon, the culture around the marathon is so awesome, you don’t care that the course is brutal. And if the course doesn’t kill you, the monkeys will. For this race, the whole family made the trip to Nashville on Saturday with the race on Sunday. Due to poor planning on my part, because My Lovely and Talented Wife is the awesome planner, we missed out on Children’s Museums on Saturday. This was my 4th running of the Flying Monkey Marathon, I had previously ran in 2008, 2009 and 2010. I had missed the 2011 running because I stupidly thought I could get registered with no problem, but it was closed before I could even blink. 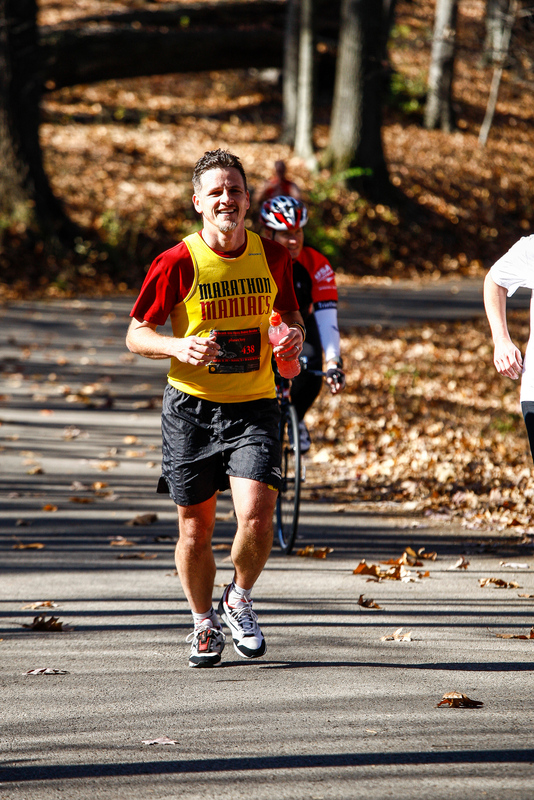 This year, registration was done by weighted lottery and because I wasn’t sure if I would get into Flying Monkey, I completed the early registration for Chickamauga Marathon as a “back-up”. If I was chosen to run Flying Monkey then it would be “oh well, gosh darn, I’ll just have to run both”. And that is what happened. Because Flying Monkey is 1) A tough course: They have Big Hills and 2) I ran a PR time of 4:08:02 at Chickamauga just 8 days earlier, I had no expectations on my performance at Flying Monkey. All I wanted to do was finish. And finish I did! The one nice thing that happens is that there are pre-race photos for running groups which cuts out the whole “where is the picture going to be”. I know that Marathon Maniacs (I’m MM#1225 – which Flying Monkey 2008 was my qualifying race) and Run It Fast both had group pictures and I think the other group was those runners that had run all the Monkeys to date. Starting off the race was pretty easy. Like I have mentioned earlier, this was just a leisurely run in the (literal) park. Corresponding with the course profile, my mile split times were correlated positively with the elevation changes. During these first few miles, I was running with a runner who had run all of the Flying Monkey and was just passing time. By about this time, I realized that the pace that I was running was fairly comfortable, very comfortable and by the calculations, I would be finishing in a sub 5 hour time. But it was a no-worries marathon and I figured I would keep the pace and see what happens. Unfortunately, writing a race report almost 9 months post-race about a race on a course previously ran 3 other times, the memory tends to blends races together. However, things were still going well, pace going well, legs in good shape. With things going relatively well, it was now a question could I accomplish my Monkey Goal. I would be pretty close. One of the cool things about the Flying Monkey Marathon is that once you get a bib number, you keep your bib number. My bib number is 438. So my Monkey Goal is to finish in 4 hour 38 Minutes. In 2008, I was close with a 4:43, but then in 2009, I was 5:31 and in 2011 I finished in 5:41. On final approach to the finish line at Flying Monkey, the course breaks out from the roadway and crosses into a field with about 0.3 of a mile to go. The about 1/2 of the approach is to a tree, which you take a left turn then the remaining 0.15 mile is a straight shot to the finish line. It is this rounding the curve where I make my final move to overtake anyone at the finish. My first Monkey finish, I finished running with The Elder and The Younger. My other Monkey finishes have been foot races, coveting a higher finishing spot in the overall results over other runners. This finish was no different. After the left turn around the tree, I started to pick up speed. I could tell that as I passed two runners, that at least one of them was going to challenge me toward the finishing. Sensing that they were starting to accelerate to catch me, I started to go full throttle. I had never put on my timing chip, so the race results do not really indicate how I finished. I only had my watch time, which would be close to my actual net time. I finished the 2012 Flying Monkey Marathon, officially, in 4:31:22, 149th out of 285 finishers, 19th out of 22nd for my age group. Most importantly, I beat my Monkey Goal, by a quite a bit. I was truly amazed that I had ran the entire race so strongly to have kept up that pace. Another successful Flying Monkey Marathon. One bit of Terry Trivia, finishing the Flying Monkey for the 4th time ties it with the number of finishes of the Richmond Marathon (1999, 2000, 2001, 2002). I am currently signed up for the 2013 Flying Monkey Marathon (Faster than a speeding banana). 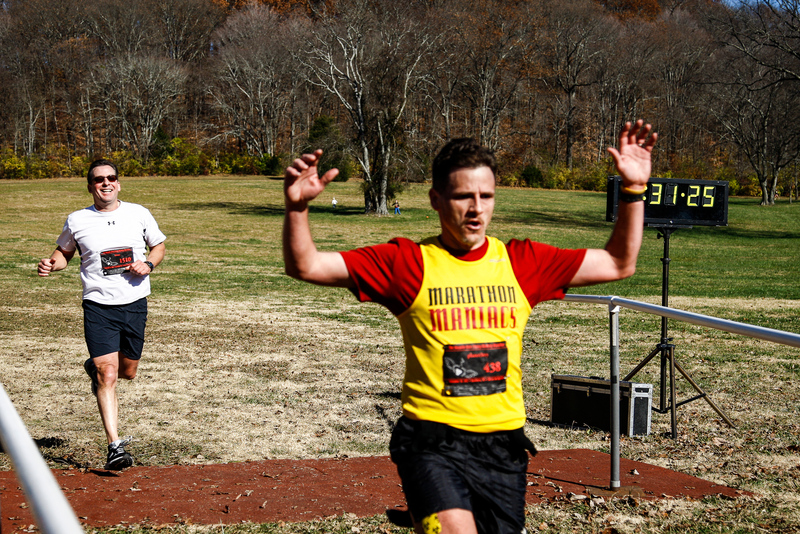 This entry was posted in running and tagged flying monkey marathon, marathon, race report. Bookmark the permalink. I am amazed that you can do and do and do!